Members of the RT1-E2 family are all highly homologous to one another, and the number of RT1-E2 loci varies from one to four per MHC haplotype among the six rat strains studied so far, with some loci predicted to give rise to soluble molecules. The RT1 n MHC haplotype (found in BN rats) carries a single RT1-E2 locus, which lies in the RT1-C/E region of the MHC and displays the typical exon-intron organisation and promoter features seen in other rat MHC class I genes. We present evidence that: i) RT1-E2 molecules can be detected at the surface of transfected mouse L cells and simian COS-7 cells, albeit at low levels; ii) their transport to the cell surface is dependent on a functional TAP transporter. In L cells, their transport is also hindered by protease inhibitors, brefeldin A and monensin. These findings suggest that RT1-E2 molecules probably associate with ligands of peptidic nature. The high homology between the RT1-E2 molecules isolated from divergent rat MHC haplotypes is particularly striking at the level of their extra-cellular portions. Compared to other class I molecules, this suggests that RT1-E2 molecules may associate with well defined sets of ligands. Several characteristics point to a certain similarity to the mouse H2-Qa2 and human HLA-G molecules. Mature MHC class I molecules are heterotrimers composed of a heavy chain polypeptide, a light chain (β2-microglobulin) and a small molecular weight 'ligand' that is usually, but not always, peptidic in nature. In all vertebrate species studied to date, MHC class I heavy chains are encoded by several genetic loci, some of them highly polymorphic. The principal site of variation is the ligand-binding groove, formed at the apical face of the molecule by the α1-α2 co-domain of the heavy chain. Most, but not all of the MHC-encoded class I molecules characterised to date are endowed with a role in presentation of antigenic ligands to cells of the immune system that have cytolytic activity. A distinction can be made, however, between classical and non-classical class I molecules. Class Ia, or classical, molecules are expressed at high levels on virtually all nucleated cells of the organism, with the notable exception of cells found in some immunoprivileged sites such as the central nervous system (CNS) and the placenta. Class Ia molecules are very heterogeneous within an outbred population, particularly at the level of the ligand binding groove, which is used to present short peptides of endogenous origin to CTLs via their T cell receptor (TCR). The main role of class Ia molecules is to allow CTLs to detect and destroy cells invaded by viruses or intracellular bacteria, so limiting the multiplication and spread of these pathogens. By contrast, class Ib, or non-classical, molecules are expressed at much lower levels than the classical ones, and in some cases they have more restricted tissue distributions. They are also less polymorphic, which could be explained in some cases by the fact that they associate with ligands that are much less prone to genetic variations . For example, CD1 molecules can present microbial phospholipids, H2-M3 selectively binds to peptides carrying N-formyl-methionine residues, and HLA-E and its functional homologues in other species, H2-Qa1 in the mouse and RT-BM1 in the rat, associate with sequences derived from MHC class Ia leader peptides. Whilst others have proposed that these class Ib molecules derived from convergent evolution , we have argued that they are most probably orthologues . Class Ib molecules can be recognised by a wide array of receptors, including not only αβ TCRs but also γδ TCRs and a whole variety of inhibitory or activatory receptors present at the surface of NK cells, NKT cells and even cells of the monocyte/macrophage lineage [4, 5]. Hence, whilst class Ia molecules have a prominent role in inhibiting NK cell lysis, in line with the 'missing-self' hypothesis , class Ib molecules can have more complex roles in modulating negatively or positively the immune response . Prominent expression of certain class Ib molecules has been found in immunoprivileged sites, e.g. HLA-G in the human placenta  or RT1-U in the rat central nervous system . The definition of an immunoprivileged site is a tissue where non-histocompatible grafts are rejected less vigorously than elsewhere, such as in the central nervous system, the anterior chamber of the eye or the placenta . During pregnancy, the foetus is tolerated by the maternal immune system despite the fact that it effectively represents a semi-allogeneic graft (and even fully allogeneic in the case of surrogacy). The expression of HLA-G in the cytotrophoblast, at the foeto-maternal interface, in place of the class Ia counterparts, HLA-A and HLA-B, has long been suspected to contribute to this induction of tolerance. Whilst the precise 'raison d'être' of HLA-G is still evasive , this molecule is clearly capable of performing functions that can either activate or inhibit immune responses. On the one hand, when expressed in transgenic mice, it can fulfil a role in antigen presentation to mouse CTLs . On the other hand, it is endowed with at least four inhibitory functions relevant to immune responses: first, it can bind directly to inhibitory receptors found on NK cells and other leukocytes [4, 5]; second, it possesses the appropriate leader peptide for binding to HLA-E, which will in turn inhibit NK cells via their CD94/NKG2 receptors ; third, as shown recently, soluble forms of HLA-G produced by placental cells induce apoptosis of activated CD8+ T cells , and fourth it can inhibit CD4+ T cell proliferation . The fact that no obvious orthologue of HLA-G has yet been identified in rodents has made it difficult to investigate the precise role of this class Ib molecule, and somewhat tempers the notion of its potential pivotal importance in the healthy development of foetuses during pregnancy. In mice, two class Ib molecules have been suggested as potential functional homologues for HLA-G, namely T25  and Qa2 . Whilst very little data on the actual expression and function of the former have so far been produced, more and more evidence has accumulated to suggest that Qa2 molecules have multiple characteristics reminiscent of those of HLA-G, namely the capacity to activate alloreative CTLs , the existence of soluble forms , the inhibitory activity towards NK cells , and the expression in oocytes . In rats, the expression in the placenta of transcripts encoding soluble class Ib molecules related to RT1-E u was reported earlier . Interestingly, we have found that transcripts for molecules very closely related to those identified in placenta can also be found in neurospheres , which are in vitro cultures of neural stem cells , as well as in cDNA libraries of lymphoid tissues. Altogether, these form a group of sequences that are very closely related to one another, and more distantly to the RT1-E u molecule . We have therefore chosen to name the members of this group RT1-E2, and report here on their characterisation. (I) There was no detectable staining with either of the antibodies in the cells freshly isolated from embryonic striatum (Fig 1A). FACS analysis of MHC expression in neurospheres. Cells were stained by indirect immunofluorescence and levels of expression were analysed by flow cytometry as described in M&M. A: Time course comparison of staining levels attained with MRC OX-18 (diamonds), which stains both class Ia and Ib molecules, or with F16.4.4 (circles) which stains only class Ia molecules. Days of successive passages are indicated by P1, P2, P3. Similar results were obtained in two other experiments. B: FACS profile of cells having aggregated as neurospheres after 48 h of culture. C: FACS profile of the CRNK cell line. For all experiments, both antibodies were used at saturating concentrations. (II) In those cells recovered in neurospheres after 48 hours, staining with MHC class I-specific antibodies could consistently be detected, albeit at extremely low levels (Fig. 1A). Given that the vast majority of the cells die during the first 48 hours of culture , it is unclear whether this MHC class I expression was somehow induced, or whether the capacity of cells to survive, aggregate and proliferate correlates with a pre-existing low level of expression of MHC class I molecules at their surfaces. 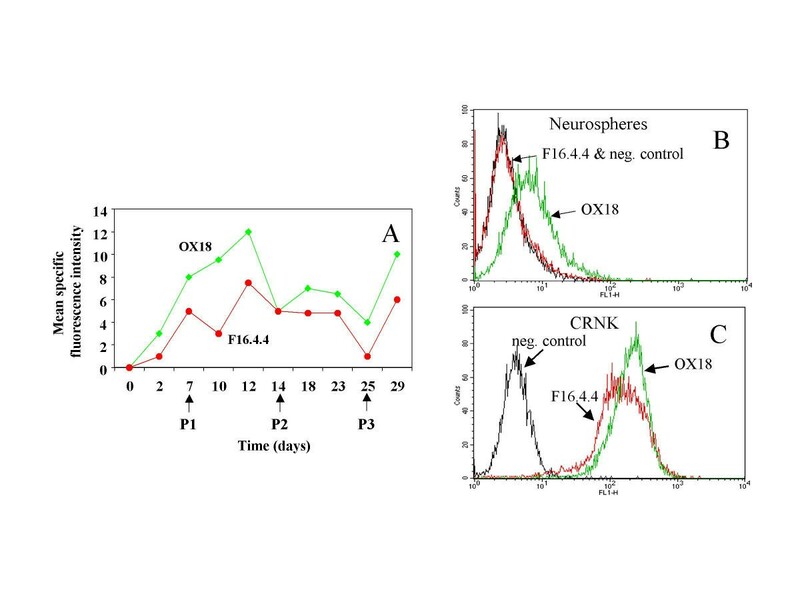 (III) MHC class I expression in neurospheres rose progressively over the course of the first week, the staining obtained with MRC OX-18 appearing sooner, and being consistently higher, than that obtained with F16.4.4. 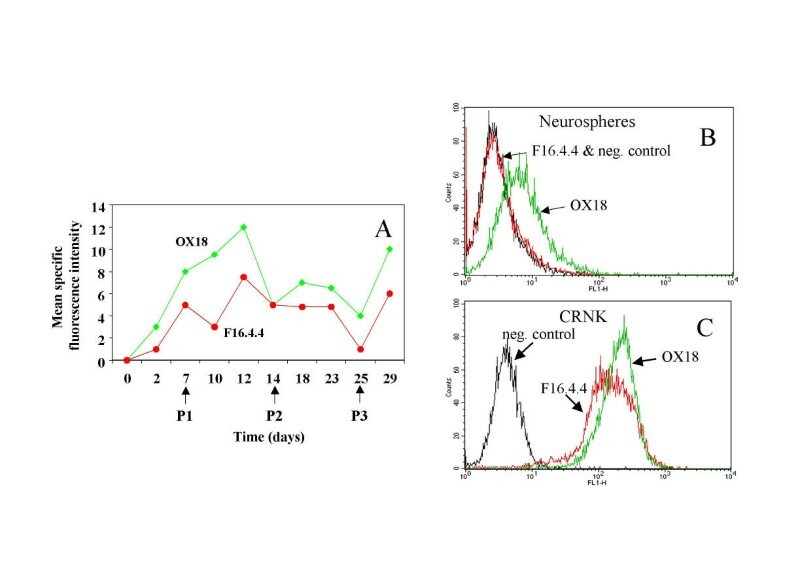 In some cases, such as the one shown in panel B of Figure 1, we even obtained positive staining with MRC OX-18 and absolutely none with F16.4.4, suggesting that neural precursors initially express MHC class Ib but no class Ia molecules, the expression of the latter arising after a delay of a few hours or a few days. The differences in staining levels were not due to a difference in staining efficiency between the two mAbs since such a discrepancy was not found on cells that express MHC class Ia molecules at high levels, such as the CRNK lymphoblastoid cell line (Figure 1C). Furthermore, in separate experiments on mouse L cells stably transfected with RT1-Al, we also found that F16.4.4 always stains RT1. A molecules at least as well as MRC OX-18 (not shown). We also noted that, after the first passage and over the course of the next two to three weeks, the MHC class I staining levels, particularly those obtained with F16.4.4, were much more difficult to reproduce between experiments, and could go up and down erratically at various stages. Attempts to correlate these variations with cell density, neurosphere size, medium composition, time after passage or feeding of cells were unsuccessful (not shown). To identify which MHC class Ib molecules were predominantly expressed, we carried out RT-PCR on mRNA isolated from early stage LEW neurospheres, using PCR primers designed to anneal to regions that are conserved in most rat MHC class Ia and Ib transcripts [27–29] (see M&M). A first screen was performed by transient transfection of COS-7 cells with 18 plasmid clones that contained DNA inserts of the expected 1.1 kb size. Thirteen clones drove expression of a molecule that behaved serologically like the RT1-Al molecule, whilst the other five led to at best very faint staining with the MRC OX-18 antibody, and no staining with other RT1-Al-reactive mAbs, including F16.4.4. Sequencing of these five clones revealed that one corresponded to the RT1-Cl antigen , while the other four were highly homologous (>98%) to one another and to a sequence we had previously reported and designated RT1-E g . These clones, and many others identified from other sources representing a total of six MHC haplotypes as well as from additional screening of PCR-generated cDNA clones from LEW neurospheres and from LEW placenta, are listed in Table 1. Comparative analysis of all these sequences allowed us to identify and discount the numerous PCR-generated mutations, as well as the PCR-generated hybrids, and to attempt to classify them according to their relatedness over the sequences from exons 4 to 8 (residues 181–356 of the protein alignment shown on Figure 2). From previous experience [27, 29], we know that this portion of the genes for MHC class I molecules, which codes for the α3 domain, the trans-membrane and the intra-cytoplasmic regions is often the best locus indicator when comparing sequences from different MHC haplotypes. As can be seen from Figure 3, phylogenetic analysis of our collection of sequences confirmed their close relatedness, and their separation from the group formed by RT1-A molecules. 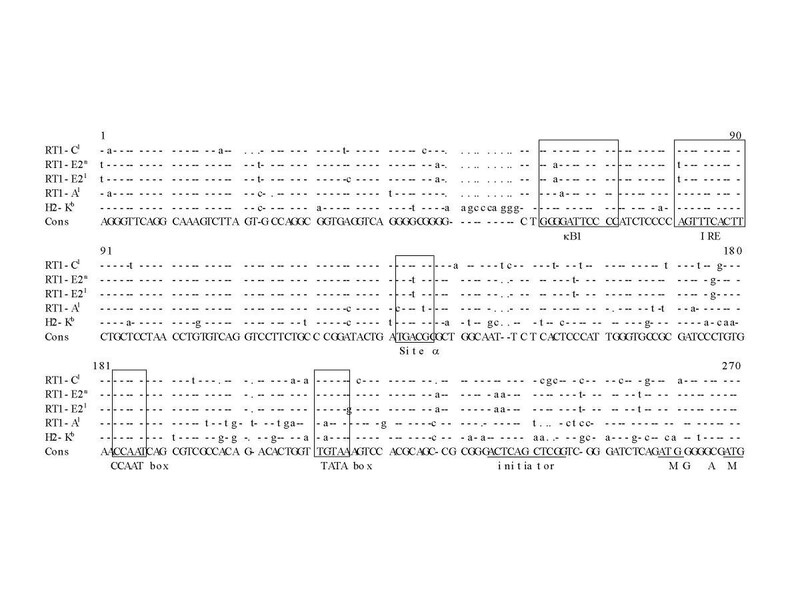 For 11 out of 13 sequences within this group, there is an even more striking level of homology over the first 180 amino acids which constitute the antigen binding groove, with very rare variations observed at only five positions. Over the same region, the remaining two sequences, RT1-E u and RT1-Eav 1, fall on the same branch of the tree, but with a relatively low support value. These two sequences are, however, more closely related to other classical RT1-A sequences, or even to human HLA-A2 or -G, or mouse H2-Q7 or -Q8/Q9. Alignment of RT1-E2 protein sequences deduced from the cDNA sequences summarised in Table 1with those of other rat class I sequences. For E2ba (acc. 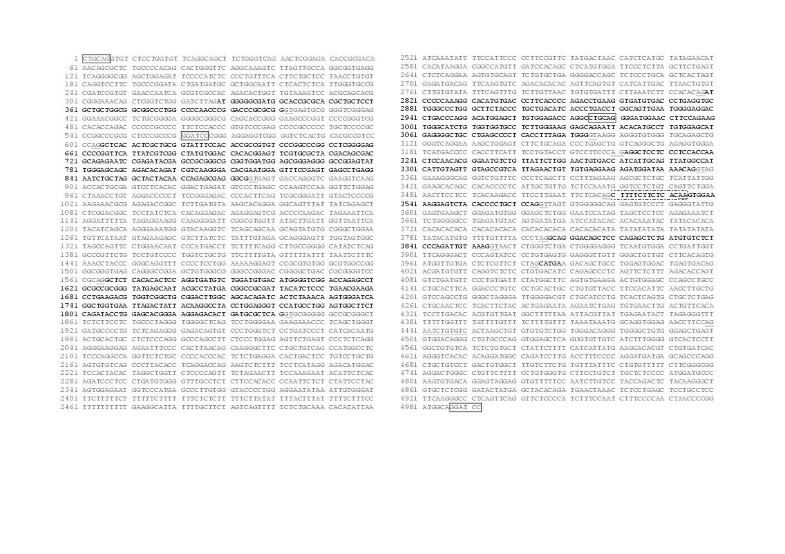 AJ537439), the translated sequence ends prematurely because of a frameshift at the start of exon 5 (see text). The line E2ba* shows the notional downstream translation of the cDNA sequence if this frameshift was not present. In the sequences from which the RT1-E2g (acc. AJ243338) sequence was compiled (p57, p4.4, p4.6), underlined residues correspond to positions that differ from all the other RT1-E2 sequences, and could therefore be due to either PCR mutations or true allelic differences. Others accession numbers are as follows: E2bu: AJ537420, E2bl: AJ537417, E2an (deduced from genomic): AJ315490, E2al: AJ276126, E2cl: AJ537418, E2dl: AJ537419, E2dc: AJ537441, Eav1: AJ537440, Eu: AJ306619, Al: L26224, Aa: M31018, Au: X82106. Alignment of the corresponding DNA sequences is available as supplementary data or upon request. Phylogenetic comparison of RT1-E2 protein sequences. Phylogenetic trees were obtained by quartet puzzling , based on the alignment of protein sequences shown on Fig. 2. Because they are subjected to different selective pressures, the upstream and downstream regions of MHC class I molecules evolve differently, and at different rates. We therefore compared the sequences separately. 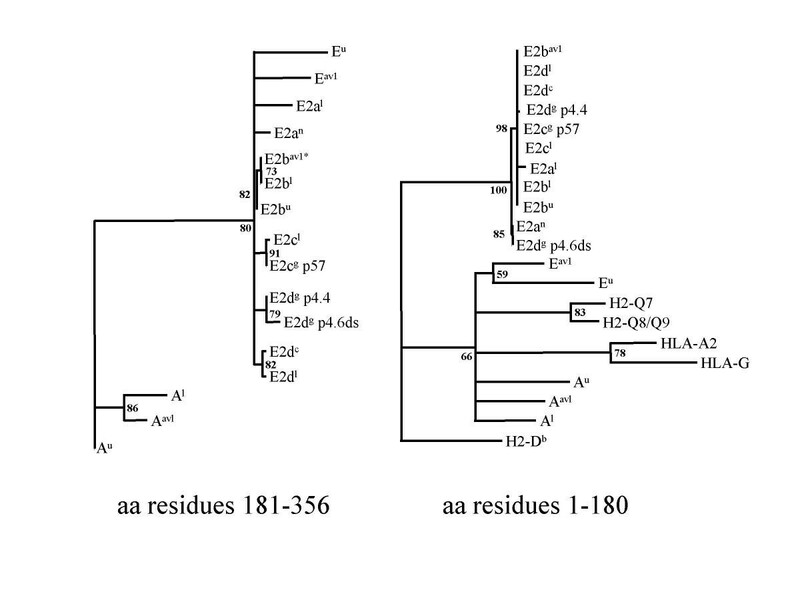 The left-hand side tree is based on comparing residues 181–356 corresponding to the α3 domain and the transmembrane and intracytoplasmic regions. Because of their high level of divergence after residue 275, the mouse and human sequences were not included in this comparison. The right-hand side tree is based on comparing residues 1–180, corresponding to the α1/α2 co-domain that forms the antigen binding groove. footnote: * Sequences whose names appear in italics (i.e. E u , Pa and clone 4) were obtained by other groups from different sources. We decided to call the members of the 11-strong group RT1-E2 to mark their close relatedness to one another, and their relative distance from RT1-E sequences. Remarkably, the number of RT1-E2 loci is apparently quite variable among haplotypes, but at least one locus is present in every one of the six MHC haplotype we have analysed, whereas RT1-E sequences were identified in only two out of those six MHC haplotypes. cDNAs deriving unambiguously from four separate RT1-E2 loci were identified in the RT1 l MHC haplotype carried by LEW rats, which we call RT1-E2a l , -E2b l , -E2c l and -E2d l . We decided on this nomenclature rather than calling these sequences -E2, -E3, -E4 because for some of the haplotypes where only one sequence was identified, the classification into those four loci is rather tentative since it relies on only a handful of residues within the intracellular portion of the molecule (see Table 1 and Figures 2 and 3). For example, for the RT1 g haplotype, where only three clones were obtained through RT-PCR, we cannot conclude whether the differences between these are the result of independent clones from three separate loci, or of PCR-generated artifactual hybrids between sequences derived from two or more loci. First, transcripts from the RT1-E2a l locus, which were initially identified in LEW placenta , all lack exon 5, which codes for the transmembrane domain. Second, out of the five clones for RT1-E2bl also obtained from LEW placenta, one carries a dinucleotide deletion at the exon 4 to exon 5 boundary, due to the use of the first two nucleotides (AG) of exon 5 as a splice acceptor instead of the one that lies just in front (see Fig. 4). This results in a frameshift and in a termination after a stretch of 30 amino acids that are not particularly hydrophobic and do not match significantly any known protein in databases. The protein translated from such a transcript would therefore most probably be soluble rather than membrane bound. This observation suggests that, within the same locus, alternate use of one or the other of these two adjacent splice acceptors can lead to either a membrane-bound or a soluble molecule. It is worthy of note that the very same type of frameshift was also found in the single RT1-E2bav1 clone (Clone DA9) isolated from a cDNA library from DA lymphoblasts. Since only a single clone was obtained, we cannot be certain that the upstream, 'canonical' AG acceptor site of exon 5 is present in the RT1-E2av 1locus, and therefore whether such membrane-bound molecules can be produced from it. Sequence of the RT1-E2 n gene. The sequence was derived after subcloning the upstream 2.8 kb Pst I and 4.5 kb BamH I DNA fragments obtained by restriction digest of both the 473K19 and 303P13 PAC. Corresponding restriction sites are boxed. The coding sequence is presented in black whilst non-coding regions (introns, 5' UTR and 3' UTR) are in grey. Splice donors (GT) and splice acceptors (AG) are underlined, as well as the polyadenylation site. The fifteen nucleotides at the start of exon 6 which are boxed in dashed lines are predicted to be systematically present in the cDNAs for RT1-E2n, like those from the RT1-Eu and RT1-E2al loci because the 'canonical' second splice acceptor (AG) is mutated to AA. For E2cl and E2dl, the second splice acceptor is conserved as AG, and the corresponding 15 nucleotide segment is present in only a small proportion of the clones obtained (see Table 1). Third, the other four clones obtained from this DA library were for the RT1-Eav 1molecule, and harbour a 36 nucleotide deletion in the middle of exon five, resulting in the removal of the entire stretch of hydrophobic residues that constitute the membrane spanning region. Comparison of the large collection of RT1-E2 cDNAs that we obtained revealed two sites where alternate splicing events apparently take place, both of them in regions corresponding to the intracytoplasmic domain of the protein. Firstly, at the junction of exons 5 and 6, the addition of 15 nucleotides results in a stretch of 5 amino acids (TAFLL) in the final protein products. In RT1-E u , RT1-E2a l and RT1-E2 n this is systematic since it is due to a single nucleotide mutation at the level of the splice acceptor at the start of exon 6, which changes from the canonical AG-GTGGGA, which is found in most rodent class I genes, including RT1-A u , to AA-GTGGGA. 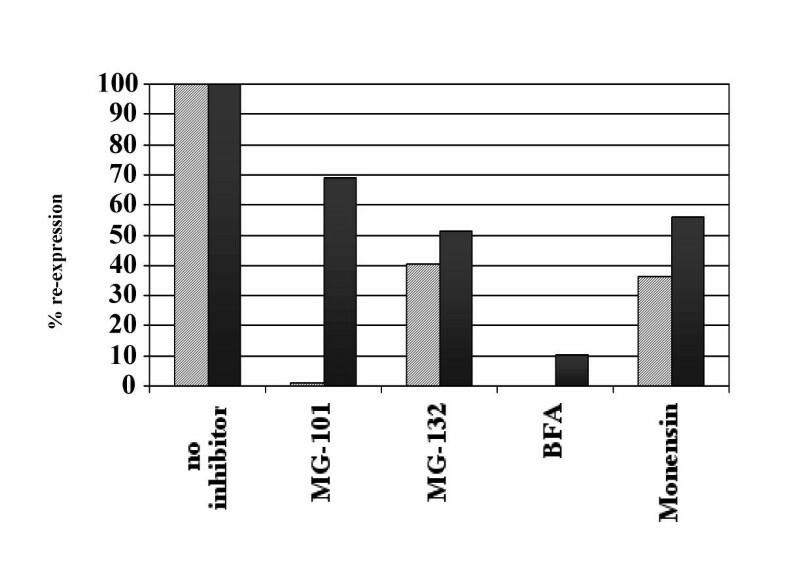 This results in the use of another AG splice acceptor found 15 nucleotides upstream in the sequence of intron 5. In parallel with this systematically different splicing, this exon boundary is also the site of alternate splicing since we did find that the upstream splice acceptor had been used in one of the six bona fide E2c l clone and in one of ten for E2d l , despite the presence of the canonical AG splice acceptor (which was in those two cases carried by the cDNA clones themselves). By comparison, it is probably worth mentioning that equivalent events of alternate splicing at that site have never been observed in any of the several hundred cDNAs for RT1-A molecules that we have analysed over the years. On the other hand, exon 7 is a site where alternate splicing has repeatedly been observed for many of the classical and several non-classical rodent class I genes [28, 33]. In our case, exclusion of exon 7 was observed in one of the six E2c l clones and in clone 4.6 classified as RT1-E2d g .
Finally, out of the three clones obtained from a cDNA library prepared from PVG NK cells , and all deriving from a single RT1-E2 c locus, one was found to be only very partially spliced, starting in the middle of exon 2, and still carrying introns 2, 4 and 5 whilst the two others were correctly spliced out. Searching with 3' untranslated region (3' UTR) sequences from the RT1-E2 cDNA clones selected from polyA-primed libraries, scored hits with five EST clone in the nucleotide database, all of which are derived from libraries assembled from mixes of various tissues obtained from outbred Sprague Dawley rats, and so are uninformative regarding the tissue distribution of RT1-E2 transcripts. These clones cover very little of the coding sequence, and sequence comparison separates them into two groups (see DNA alignment provided as supplemental data). The first, which consists of BG372625, AW121555 and BI300597, shows almost complete identity with the 3' UTR sequence predicted from the RT1-E2 n gene (see below). The sequence available for the first two members of this group stretches as far as the exon 5/6 boundary, and both clones carry the extra 15 nucleotides discussed previously, due to a mutated splice acceptor. The second group comprises the BI281890 and BI283769 clones that are slightly divergent, but more homologous to one another than to any of the other RT1-E2 sequences available to date. Because both of these sequences end very close to the stop codon, we could not conclude definitively whether they are representative of RT1-E2 or of another closely related locus type. On the basis of these multiple RT1-E2 sequences, we designed a specific primer pair (E2us-E2ex5) that could be used for the diagnostic PCR amplification of an internal portion of the cDNA from the start of exon 3 to the start of exon 5 (for more information, see M&M and DNA alignment provided as supplemental data). Using this for RT-PCR on mRNA derived from various LEW tissues, we could detect a broad distribution of RT1-E2 mRNA, albeit at lower levels than in the placenta. More specifically, RT1-E2 transcripts were as prominent in placenta as in neurospheres, readily detected in spleen, kidney and testis but much more difficult to detect in mRNA prepared from brain parenchyma (data not shown). Searching nucleotide databases for homologues of RT1-E2 sequence only revealed one hit called "clone 4" (acc. U50447). We have previously argued  that this "clone 4", a cDNA isolated by RT-PCR from BN rat splenocytes  was probably a PCR-generated hybrid comprising the 550 nucleotide upstream part of a class Ib sequence, where it differs from the sequence previously designated as RT1-E g by only two nucleotides, and the downstream part of RT1-A1 n . The fact that "clone 4" was isolated from a BN rat suggested that the RT1 n MHC region carries at least one locus for an RT1-E2 sequence. The search for RT1-E2 sequences in the BN haplotype was greatly facilitated by the physical map published by Ioannidu and colleagues . A set of overlapping PAC clones covering the MHC class I regions likely to contain the RT1-E2 n (BN) genes was obtained from the Resource Centre of the German Human Genome Project (RZPD, Berlin, Germany) (see M&M). DNA from these PACs was digested by either BamH I or PstI, and analysed by Southern blotting with oligonucleotide E2us. This probe hybridised to the overlapping PAC clones 473K19 and 303P13, and revealed a single BamH I fragment of 4.5 kb and a single Pst I band around 2.8 kb. These bands were subcloned from the corresponding PAC and sequenced. 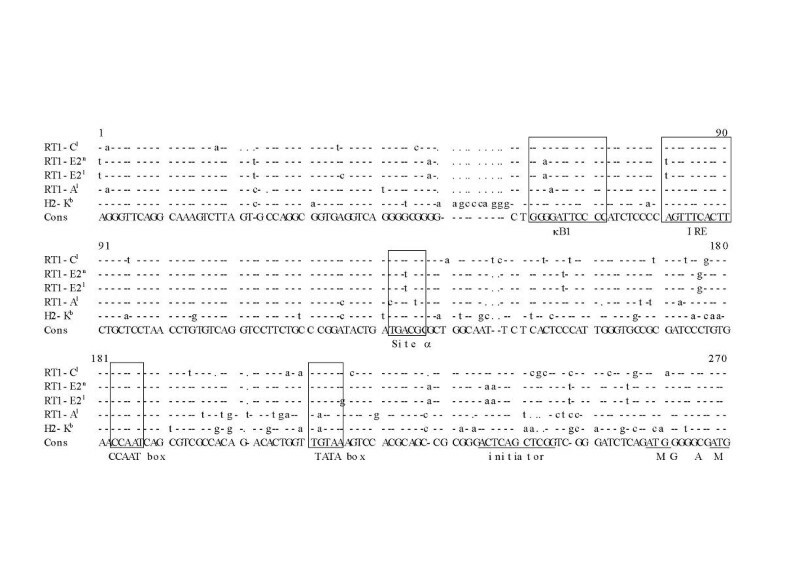 The single sequence, which covers 4992 nucleotides, comprises the entire sequence of a class I gene, including 300 bp of its promoter and the 8-exon structure typical of most MHC class I genes (Fig. 4). Our results suggest the existence of a single RT1-E2 gene in the RT1 n MHC haplotype, and are compatible with this gene being located at the telomeric end of clone O06367, which had been labelled as RT1-E on the map published by Ioannidu and coworkers . The analysis of the entire genomic sequence of this region (acc AJ314857) confirms this finding. The hypothesis that "clone 4" is probably a PCR-generated hybrid is now further supported since the RT1-E2 n genomic sequence that we describe here matches the upstream sequence of "clone 4" perfectly, but differs from it downstream. RT1-E2 genes appear to follow a somewhat different pattern of expression from those of classical class I molecules. This may be due to divergent sequences in the promoters of these genes determining differential binding of transcription factors. We therefore compared the sequences of the RT1-E2 n promoter with those of some other murine class I genes, namely RT1-A l , RT1-C l and H2-K b (Fig. 5). We also included in this comparison the sequence of an 840 bp PCR-generated genomic clone of LEW origin, which starts 300 nucleotides upstream of the initiation codon, and finishes in the middle of exon 2. This clone, which was obtained by chance in the course of separate investigations in our laboratory , very probably carries the promoter and upstream region of the RT1-E2c l gene since, over the upstream coding sequence where they overlap, it is indistinguishable from the cDNAs from this locus derived from LEW neurospheres and placenta. The RT1-E2 n and the RT1-E2c l promoter sequences differ only in one nucleotide just after the TATA box sequence, TGTAAA vs TGTAAG. Because the RT1-E2c l sequence derives from a single clone generated by RT-PCR, we cannot determine whether this difference is genuine or whether it corresponds to a PCR-generated mutation. 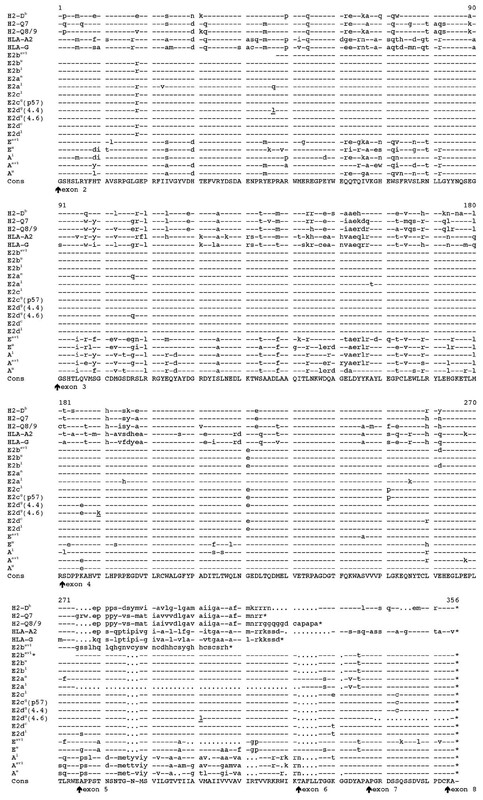 Alignment of the promoter regions of selected murine class I genes. The promoter sequence for RT1-Al is from AF025309 , RT1-Cl: AF025308 , H2-Kb: M11847 , RT1-E2n: AJ315490, RT1-E2l: AJ537416. The comparison of the various boxed regulatory elements is discussed in the text. Whilst the sequences of these RT1-E2 promoters are relatively well conserved compared to the other MHC class I genes, several differences that are localised in the key regulatory DNA sequences can be observed. The three important elements within the core promoter are the CCAAT box, the TATA box and the initiator . The CCAAT box is conserved among the genes that we compared. Whereas H2-K b and RT1-A l contain a canonical TATA sequence, RT1-E2 shows the variant sequence TGTAA also found in RT1-C l and the mouse H2-Q6 to H2-Q9 genes (not shown here). Since MHC class I gene expression is also dynamically regulated by cytokines, we examined the three major elements within the upstream promoter region, namely the κB1 element [39, 40], the Interferon Response Element (IRE) and site α, which is crucial for routes of activation involving the transcriptional coactivator CIITA [41, 42]. All three sites were identified in the RT1-E2 promoters, but were found to diverge from those of other class I promoters by individual nucleotide differences that could presumably result in alterations of its activity. Preliminary experiments carried out with luciferase-based reporter constructs containing either the RT1-E2 n or the H2-K b promoter suggest that the RT1-E2 promoter is much weaker than that from H2-K b , but that transactivation can be boosted by the transcriptional coactivator CIITA and by NF-κB (not shown). This finding is in line with a recently published computer algorithm which predicts that the sequence of the κB1 element found in RT1-E2 would still support transactivation by NF-κB . The activity of the RT1-E2 promoter would thus still be subject to modulation by certain cytokines via CIITA and NF-κB, as described for other MHC class I genes [38, 44]. An RT1-E2 u cDNA clone derived from PVG-RT1 u neurospheres was selected for the stable transfection of the mouse L cell line. In the resulting G418-resistant cells obtained, low levels of expression were detected with MRC OX-18 in approximately 50% of the population. Those cells were selected by flow cytometry, and were later cloned in order to obtain a population that did not lose expression of the RT1-E2 u molecule over successive passages. The levels of MRC OX-18 staining attained with these transfectants were better than in transiently transfected COS cells, but much lower than those seen with stable L cell transfectants for many other rat or mouse class I molecules generated using the same procedure [27–29, 31, 33] (Fig. 6). 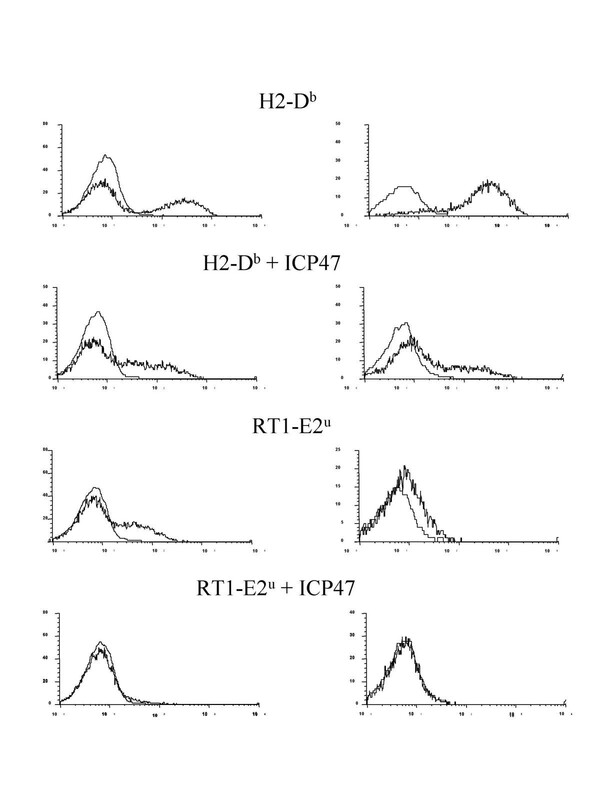 Treatment of the RT1-E2u L cells transfectants with γ interferon resulted in a three to four fold increase in the levels of cell surface expression detected, to levels that remained very inferior to those detected for class Ia counterparts (not shown). The possibility that this low staining was not due to a low level of cell surface expression but to a low affinity of MRC OX-18 for the RT1-E2u molecule was ruled out by antibody titration experiments showing similar saturating concentrations to those observed for L cells transfected with RT1-A (not shown). Analysis of these transfectants with other RT1-reactive rat monoclonal antibodies has so far failed to identify other antibodies crossreacting with the RT1-E2u molecule (not shown). The RT1-E2 u molecule is expressed at low levels at the surface of transfected L cells. L cells transfected with either pSV2 neo alone, or together with either pCMU-E2u, or pCMU-Au , were stained with saturating concentrations of MRC OX-18 hybridoma supernatant, followed by a FITC-conjugated anti-mouse Ig secondary polyclonal reagent. 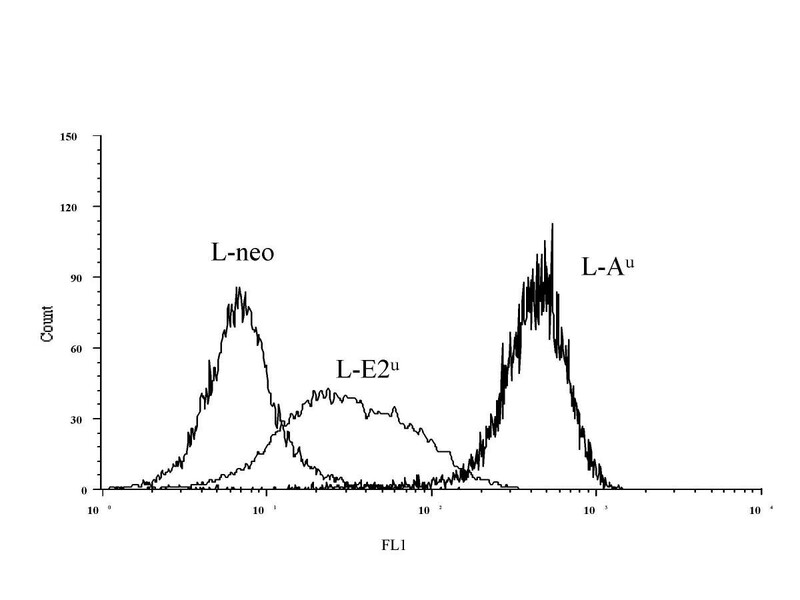 The cellular requirements for RT1-E2 expression were investigated as follows: correctly conformed MHC class I molecules were first removed from the surface of the L cell transfectants by means of a brief acid treatment (pH 3.0). Subsequent recovery of class I expression was measured after six hours of culture in the presence or absence of various inhibitors, using MRC OX-18 to detect RT1-E2 and mAb 11-4-1 to detect H2-Kk (endogenous to L cells). As can be seen in Fig. 7, incubation of the cells with drugs that inhibit either many of the cellular proteases (MG-101) or more specifically the proteasome (MG-132), the secretion pathway upstream of the Golgi apparatus (brefeldin A) or transport through the Golgi apparatus (monensin) resulted in each case in a significant reduction of the re-appearance of both RT1-E2u and H2-Kk at the cell surface. The observation that the treatment with MG101 resulted in a more dramatic inhibition of RT1-E2 expression than that of H2-Kk suggests that, in addition to the proteasome, the generation of peptidic ligands suitable for binding to the RT1-E2 molecules may require the contribution of additional proteases that would be very sensitive to this drug. Transport of RT1-E2 u molecules to the cell surface is affected by endoprotease inhibitors, and follows a similar pathway to that of the H2-K k class Ia molecule. MHC molecules present at the surface of transfected L cells were denatured by a brief acid treatment (see M&M). After being washed, the cells were then returned to 37°C to allow expression of new molecules, either in tissue culture medium only, or in the presence of the indicated drugs. After 6 h, cell surface expression of the transfected RT1-E2u was measured by flow cytometric analysis after staining with MRC OX-18 (striped columns), or of endogenous H2-Kk with 11-4-1 (black columns). Values used are based on means of fluorescence intensity, expressed as a percentage of re-expression compared to the cells recovering in tissue culture medium alone. In order to investigate the dependence of RT1-E2u expression upon a functional TAP transporter, we made use of the fact that the ICP47 viral glycoprotein derived from HSV-1 (Human Herpes Simplex Virus-1) can block TAP function in the simian COS-7 cell line . As can be seen in Figure 8, co-transfection of either RT1-E2u or H2-Db with ICP47 led to inhibition of cell surface expression for both class I molecules, although this effect was more profound in the case of RT1-E2u. This result was confirmed in parallel experiments in which RT1-E2u and H2-Db were subcloned into bicistronic expression vectors expressing EGFP after the Gtx IRES (see M&M). Gating on the EGFP-expressing cells after transfection of these vectors, a dramatic increase in the proportion of cells expressing the MHC molecules was seen among the cells analysed (Fig. 8, right column). The levels of class I expression attained per cell were, however, slightly lower using this system, and this is particularly noticeable for RT1-E2u (panels C and G). Considered together, these results suggest that RT1-E2 molecules follow intracellular pathways similar to those of classical class I molecules, and the dependence of their surface expression on the TAP transporter and active proteases points to their probable assembly with ligands of a peptidic nature. The transport of RT1-E2 u to the surface of transiently transfected COS-7 cells is dependent on a functional TAP transporter. 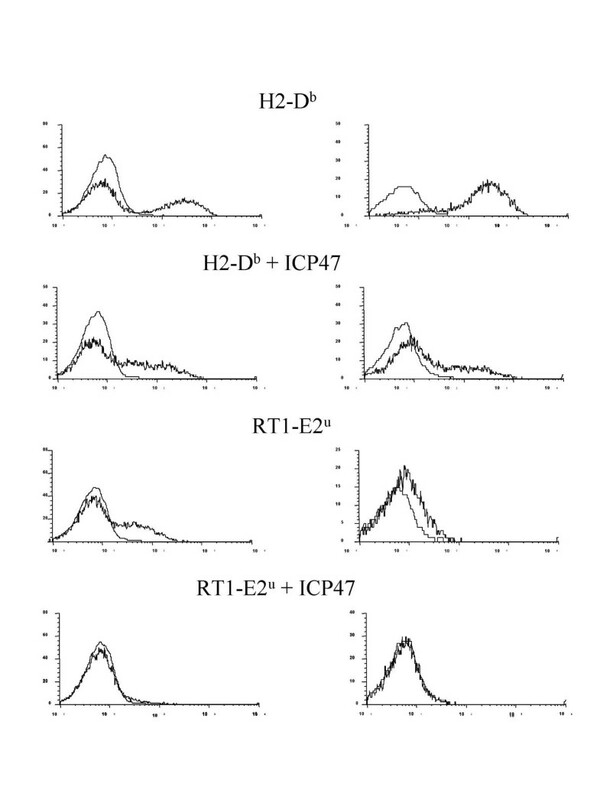 For all panels, graphs are from flow cytometric analyses after staining either for H2-Db with B22-249 (upper four panels), or for RT1-E2u with MRC OX-18 (lower four panels). The fine lines are for cells labelled only with PE-conjugated secondary antibody. For both H2-Db and RT1-E2u, cell surface expression was significantly reduced when an expression-plasmid for the TAP-inhibitor protein ICP47 was co-transfected. For the analyses shown in the right-hand column, the proportion of COS-7 cells expressing the MHC molecule of interest was improved by transfecting bicistronic vectors carrying a Gtx IRES-EGFP sequence after that of the MHC class I molecules (see M&M), and gating only on the EGFP-expressing cells for analysis. In the developing mouse brain, expression of MHC class I molecules has been reported to have a role in the establishment of neuronal connections [46, 47]. These studies also showed that different mouse MHC class I H2 loci displayed different well-defined spatio-temporal patterns of expression. A similar finding was also recorded for RT1-U, a rat class Ib molecule . Whilst our finding of RT1-E2 expression in neural precursors does not prove its direct involvement in the establishment of the CNS architecture, this possibility will be worth investigating further. Several other reports have also suggested that expression of MHC class I molecules is generally low in cultures of proliferating stem cells of various origins [48–51], with some of these reports pointing to a preferential expression of class Ib molecules comparable to our observations with rat neurospheres [50, 51]. In all these cases, however, it may be that the expression of class Ib molecules themselves may not be upregulated, but becomes more noticeable when that of their class Ia counterparts is selectively repressed. The preferential expression of certain non-classical class I molecules could be related to the observation that stem cells are relatively insensitive to lysis by NK cells despite their lack of class Ia molecules in certain systems . The fact that grafted stem cells can induce tolerance to secondary allografts  could also be related to their expression of class Ib MHC molecules endowed with immunoregulatory functions. In other instances, however, the activity of NK cells can clearly play a very important role in limiting the efficiency of grafted cells survival . It is possible that RT1-E2 molecules could serve as markers of neural progenitor cells that proliferate, or have the potential to do so. If this were the case, RT1-E2 could be a useful extracellular marker to enrich for rat neural stem cells. This, however, will require the generation of RT1-E2 specific monoclonal antibodies. Given the striking level of inter-strain conservation of the extracellular domain of these molecules, and the fact that we have found RT1-E2 loci in all six of the rat MHC haplotypes we have studied, it is probably not surprising that we have so far failed to find RT1-E2-specific mAbs amongst the antibody panels raised using conventional rat anti-rat immunisations. Similar difficulties have been encountered in the past for other MHC class Ib molecules, against which alloreactive responses are weak or absent on account of the level of sequence conservation, while xenoreactive antibodies tend to cross-react broadly on many class Ia and Ib molecules. To overcome this hurdle, access to a transgenic mouse expressing a rat class Ia molecule constitutively would be extremely useful for immunisation purposes. Comparison of RT1-E2 sequences with known mouse class I genes has not revealed any obvious orthologue. On the other hand, the H2-Qa2 family of mouse class Ib genes does share several features with RT1-E2 that suggest they may be related both genetically and functionally. Firstly, the Q6 to Q9 loci, which encode H2-Qa2 molecules, lie in the region of the mouse MHC bordered by the framework markers Bat1 proximally and Pou5f1 (Oct3/4) distally . This interval corresponds to the RT1-E/C region in the rat within which we have mapped the RT1-E2 locus of the BN rat. As for RT1-E2, the number of loci for H2-Qa2 is variable between mouse strains, with up to six functional loci found in the H2 bc haplotype , all of which are highly homologous to one another, and some of which give rise to soluble molecules. One factor that has greatly facilitated the study of Qa2 antigens is the fact that certain mouse haplotypes, e.g. H2 k , lack a functional Qa2 locus. Whilst this has allowed the development of Qa2-specific alloreactive mAbs, it also argues against a pivotal, indispensable, role of Qa2 molecules in the vital physiological processes of mice. But this is of no great surprise since even mice made deficient for the β2-microglobulin gene remain viable, despite the alteration reported in their neuronal connectivity . Another point worth mentioning is that certain strains of β2-microglobulin KO mice breed very inefficiently , and that loci affecting fertility have been described and mapped to the region of the rat MHC where RT1-E2 genes are found . It is therefore conceivable that these observations could turn out to correlate with the expression of these class Ib molecules in the placenta. The Qa2 molecules have been shown to associate with peptide ligands  and to depend on the TAP transporter for their expression at the cell surface . The recent crystallographic resolution of the Qa2 molecule derived from the Q9 locus in combination with a nonameric self peptide revealed a shallow hydrophobic groove, providing a plausible explanation for the relatively promiscuous specificity of this MHC class Ib molecule for peptides . 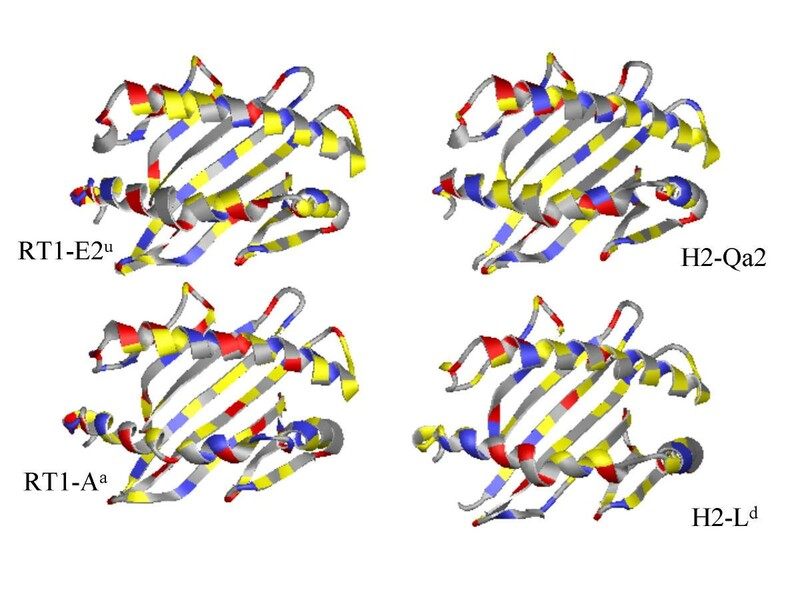 When we used molecular modelling to visualise the peptide binding groove of RT1-E2 molecules, we were struck by the overall similarity of the peptide binding groove with that of H2-Qa2 (Figure 9). 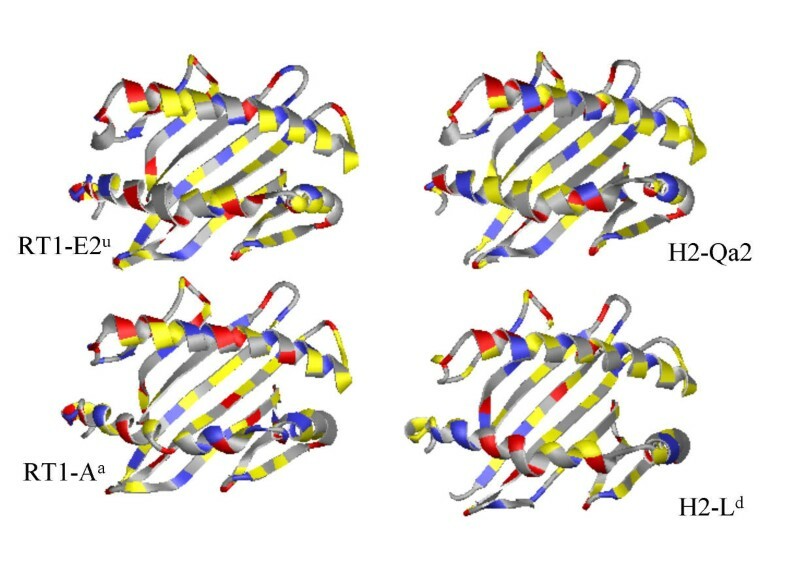 Not only do both molecules harbour a very hydrophobic F pocket, but they also carry histidine residues at position 9 and 70, which could, as in H2-Qa2, result in the absence of a C pocket, and in the bulging of peptides out of the middle of the peptide binding groove. Molecular modelling of RT1-E2 u was carried out on the Swiss model server http://www.expasy.ch/swissmod/SWISS-MODEL.html. The coordinates of 1ED3, 1QLF, 1HOC and 1CE6 were used by the server as templates to generate this model. The software Swiss PDB viewer was used to compare the resulting structure with those of RT1-Aa (1ED3), H2-Ld (1LDP) and H2-Qa2 (1K8D). Acidic residues are represented in red, basic in blue, and hydrophobic in yellow. Another recently uncovered property of H2-Qa2 molecules is their capacity to inhibit killing by NK cells . Many inhibitory and activatory NK receptors have already been uncovered in the rat, and genes carried in the RT1-E/C region of the MHC are known to regulate the activity of alloreactive NK cells [61, 62]. Regarding the capacity of MHC molecules to regulate NK activity negatively via their CD94/NKG2A receptors, there exists a very particular dichotomy at the level of the initiation of translation of the murine class I proteins: some proteins start with MGAMAPRTLLL, whilst in many others, including most H2-K alleles, the codon for the first methionine residue is mutated and translation therefore starts at the second one. In the latter case, it has been clearly shown that the MAPRTLLL or MAPRTLLLL peptides resulting were unable to bind significantly to H2-Qa1 , and translation of those class I molecules would therefore not result in the inhibition of NK cells via their CD94/NKG2A receptors. Whilst all rat class Ia sequences where this sequence is known to start with the first methionine, this first ATG is not present in many rat class Ib molecules including RT1-Cl  and RT1-Eu , and the second methionine is therefore used. Since both RT1-Cl and RT1-Eu have been shown to be potential activators of allorecognition by NK cells [62, 64], there is therefore a correlation whereby the molecules that can inhibit NK cell activity also have a functional codon for the first methionine, and the ones that can be recognised by NK activatory receptors do not. In this regard, RT1-E2 molecules do harbour a functional codon for the upstream methionine, and one might therefore be tempted to predict that their propensity would be more towards inhibiting NK cells. If this turns out to be true, this will be a further point of similarity with H2-Qa2 and HLA-G both of which have a potential role in inhibiting NK cell activity. Over the past few years, MHC class Ib molecules have been the focus of an ever-increasing amount of interest, related to their multiple roles in antigen presentation and immunoregulation, particularly of NK cell activity. Because of their lower levels of expression and limited heterogeneity, class Ib molecules have proven more difficult to study than their classical class Ia counterparts, especially because of the paucity of serological reagents. In mice and rats, this is further complicated by the fact that the MHC region carries many more class Ib loci than does the human MHC. Unravelling the function and evolutionary history of rodent class Ib molecules will require progressive characterisation of these various loci, and the results described here should contribute significantly towards this end. Unless otherwise specified, all chemicals were obtained from Sigma, France. Rats were bred and maintained in specific pathogen-free conditions at either the Babraham Institute (Cambridge, UK) or the "Service d' Animalerie de l'IFR 30", Hôpital Purpan, Toulouse, France. Neurosphere cell cultures were performed as previously described . Briefly, cells were prepared from the striatum of embryonic (E14) LEW rats. Following trituration, cells were plated in growth medium containing HAM's F-12/DMEM (1:3, Life Technologies) supplemented with PSF antibiotic mix (1%, Life Technologies), EGF (20 ng/ml, R&D Systems), FGF-2 (20 ng/ml, R&D Systems) and N2 supplement (1%, Life Technologies), and passaged every 7 days after trituration to a single cell suspension. The mouse L (tk-) and simian COS-7 cells were grown in DMEM (Life Technologies) supplemented with 10% fetal calf serum (FCS) and passaged twice a week by trypsinization. For the analysis of the recovery of MHC class I expression after acid wash, cells were collected, washed twice in PBS and incubated for 1 min in 1 ml of 300 mM glycine-NaOH (pH 3.0) supplemented with 1% BSA, before being washed once in growth medium. The cells were then returned to 37°C for 6 h either in growth medium alone, or in the presence of inhibitors. MG-101 and MG-132 were stored in DMSO and used at 250 μM. Brefeldin A, monensin were stored in EtOH and used at a final concentration of 5 μM. The mouse mAb MRC OX-18  recognises an epitope in the α3 domain of most rat MHC class Ia and Ib molecules, whilst F16.4.4  recognises only class Ia molecules. Supernatants from hybridomas 11-4-1  and B22-249  were used to label H2-Kk and H2-Db, respectively. All four primary antibodies were used at saturating concentrations. For MRC OX-18, F16.4.4 and B22-249, absolutely no cross-reactivity was detectable on mock transfected COS 7 or L(tk-) cells. The respective positions corresponding to these is indicated on the nucleotide alignment provided as supplementary data. This was performed as previously described . Briefly, mRNA was purified from either neurospheres or E17 rat placentas. After oligo dT-primed reverse transcription, PCR was carried out between oligonucleotides EJ 001 and EJ 002 before cloning into the pCMU-Db plasmid via Not I and Xba I sites. Plasmid DNA from recombinant colonies was subsequently analysed by restriction digestion with BamH I and Pvu II, and positive clones were sequenced using the Big Dye Terminator method (Applied Biosystems). Two cDNA libraries were screened. 1) a PVG NK cell library prepared in the eukaryotic expression vector pMet7  was amplified in E. coli DH10B (Life Technologies). 0.5 × 106 colonies were plated out, grown overnight at 37°C, and duplicate lifts made on to nylon-reinforced cellulose nitrate Opticron BA-S 83 0.2 uM membranes (Schleicher & Schuell). The membranes were denatured and neutralised by standard procedures, dried and baked at 80°C in a vacuum oven for 2 h. The membranes were hybridised with γ32P labelled oligonucleotide 380 in Puregene Hyb-9 Hybridisation solution (Flowgen) at 60°C overnight. After several washes over 2 h in 2x SSC at 50°C, the membranes were exposed to XR film (Fuji) for various periods of time. Three duplicated positive spots were selected and subjected to three rounds of purifying selection with oligonucleotide 380 to obtain single, positive colonies. 2) 2 × 105 bacteriophages from a λgt10 cDNA library prepared from DA rat lymphoblasts  were plated out on C600 E. coli, grown for 8 h at 37°C then stored overnight at 4°C. Duplicate lifts were made on to Opticron 83 or Hybond N+ (Amersham Pharmacia Biotech) membranes, which were then treated and hybridised to oligonucleotide 380 as described for the PVG cDNA library. Five positive clones were subjected to three rounds of purifying selection by hybridisation with oligonucleotide 380 to give pure phage stocks. Phage DNA was obtained by PCR using PWO DNA polymerase (Roche) and λgt10 forward and reverse primers, using an annealing temperature of 55°C. The products were cloned into pSTBlue1 (Novagen) and sequenced. Sequences were edited using GCG software (University of Wisconsin Genetics Computer Group, Madison, WI); FASTA and BLAST were used for comparisons with sequences in the online nucleotide databases. Database accession numbers for the novel or published sequences mentioned are given in the legends to Figures 2 and 5. 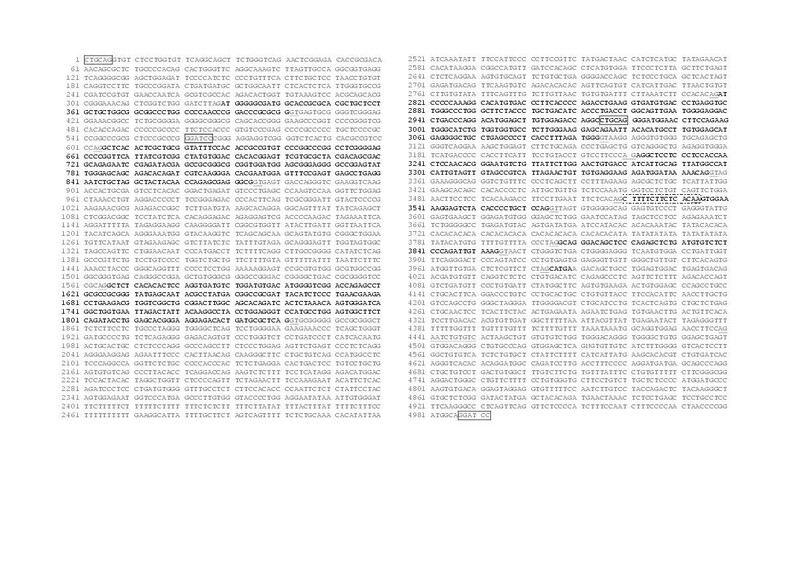 Trees for comparison of sequences were obtained using Puzzle , starting from the file of aligned protein sequences shown on Fig. 2. One thousand quartet puzzling steps were used, and support values are indicated for each branch. Trees were visualized using the "Treeview" freeware package written by Roderic D. M. Page (available on http://taxonomy.zoology.gla.ac.uk/rod/treeview.html). A set of overlapping PAC clones derived from the RPCI-31 library , and expected to cover the MHC class I region containing the RT1-E2 n gene, was purchased from the Resource Centre of the German Human Genome Project (RZPD, Berlin, Germany). From proximal to distal, these are: RPCI-31 473K19, 303P13, 31C24, 374E16, 100B16, 571A22, 583F5, 460D3 and 462P8. PAC DNA was isolated using a standard alkaline lysis "miniprep" protocol. DNA from these PAC was then digested either by BamH I or Pst I. After agarose gel electrophoresis, DNA was transferred onto Hybond-N+ membranes (Amersham Pharmacia Biotech) by passive transfer in 1.5 M NaCl and 0.5 N NaOH. Hybridization was performed overnight with the radiolabelled oligonucleotide probe E2us at 37°C in 5x SSC, 12.5x Denhardt reagent, 0.5 M sodium phosphate (pH 7.0), 2% (w/v) SDS, 0.1 mg/ml sonicated salmon sperm DNA. Washing conditions were: 30 min at 37°C in 2x SSC, 0.1% SDS followed by twice 30 min at 50 °C in 2x SSC, 0.1% SDS. After washing, Kodak X-OMAT AR5 films were exposed to membranes for various times. The pN3-ICP47 plasmid was constructed by cloning a Not I/Hind III fragment obtained from the pCDNAI-ICP47  into the pEGFP-N3 vector (Clontech). The pMCS-Gtx-EGFP was created by cloning the Gtx IRES  between the Kpn I and the BamH I sites of the pEGFP-N1 vector (Clontech). The pDb-Gtx-EGFP and the pE2u-Gtx-EGFP plasmids were then constructed by blunt-end cloning the H2-Db and the RT1-E2u cDNA obtained respectively from the pCMU-Db and the pCMU-E2u vectors into the Xho I (blunt-end) site of pMCS-Gtx-EGFP. Stable transfection of L(tk-) cells with pCMU-Db or pCMU-E2u was performed by the calcium phosphate method using pSV2neo as a co-transfection marker . Transfectants were then selected using 0.5 mg/ml G418 (Life Technologies), and cells expressing the appropriate MHC molecule were selected by flow cytometry, using MRC OX-18 for RT1-E2u, and B22-249 for H2-Db. After selection, the cells retained similar levels of auto-fluorescence. Transient transfections of COS-7 cells were performed as previously described . Cells were trypsinized and washed once in culture medium before incubation with primary antibody on ice for 30 min. The cells were then washed three times by centrifugation using cold PFN (PBS containing 2% (v/v) FCS and 0.1 % (w/v) sodium azide) before incubation with secondary antibody (fluorescein isothiocyanate [FITC]-conjugated rabbit-anti-rat IgG diluted 1/100 in PFN) for 30 min on ice. After two washes in PFN, cells were resuspended in PFN containing 2 μg/ml propidium iodide and analysed on a FACScan (Becton Dickinson, San Jose, USA) within an hour of staining. For cell sorting, PFN was replaced by sterile tissue culture medium, and an Epics ALTRA (Beckman Coulter) was used. An erratum to this article is available at http://dx.doi.org/10.1186/1471-2172-5-4. We thank Claudie Offer for excellent DNA sequencing assistance, Drs. V. Mauro, N. Shastri for kindly providing plasmids, and Philippe Le Bouteiller for his helpful advice on the manuscript, as well as the three anonymous referee's whose suggestions contributed very significantly to the editing of this manuscript. P.L. was supported by the French Polynesia Government, C.A. by the Ipsen Foundation and ARSEP, and E.J. by INSERM. The Functional Immunogenetics Laboratory at the Babraham Institute is supported by Core (Competitive Strategic Grant) funds from the UK BBSRC.